Here's a view of what's under the hood. 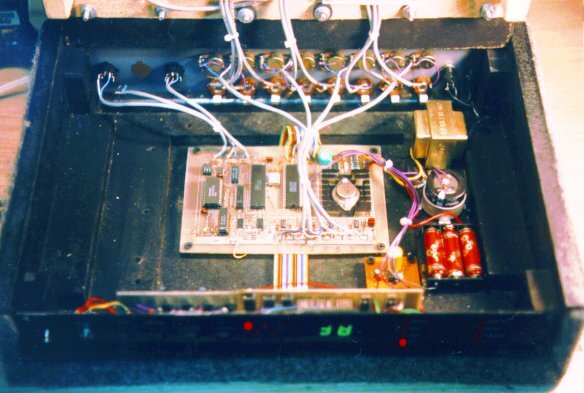 Back Panel: MIDI In, Out and Thru connectors (right side), alternate external inputs (left, bottom), and sensitivity adjustment knobs (left, top). Center right: Power supply transformer and capacitor (back), battery backup for user configuration (front), and a small breadboard that generates a reset signal (not actually used). Front Panel: (Left to right) Power LED, "all notes off" pushbutton, 4 user-input pushbuttons (pad select, parm select, increment and decrement), currently selected pad display (8 LEDs), three digit parameter value disply, and currently selected pameter name (8 LEDs). There is another similar inside photo, which shows a bit more of the lid and has a bit better view of the front panel, but the view of the circuitry is smaller. Take a closer look at the circuit board. Or go right to the main CPU schematic.